Visiting religious sites: When visiting Buddhist & Hindu Temples, Visitors are expected to be dressed in proper attire. Skirts or long trousers - Shorts & swimwear are Not allowed. Remove hats and shoes before Entering Hindu & Buddhist temples. The Department of Immigration and Emigration of Sri Lanka launched a system of visa to enter the territory of Sri Lanka. To obtain your visa, thank you for visiting www.eta.gov.lk. Sri Lanka, an island in the Indian Ocean is located to the south of the Indian subcontinent. It lies between 5O 55’ and 9O 55’ north of the equator and between the eastern longitudes 79O 42’ and 81O 52’. The total land area is 65,610 sq. km. and is astonishingly varied. A length of 445 km. and breadth of 225 km. encompasse beautiful tropical beaches, verdant vegetation, ancient monuments and a thousand delights to please all tastes. The relief features of the island consist of a mountainous mass somewhat south of the centre, with height exceeding 2,500 metres, surrounded by broad plains. Palm fringed beaches surround the island and the sea temperature rarely falls below 27OC. Recent excavations show that even during the Neolithic Age, there were food gatherers and rice cultivators in Sri Lanka. Very little is known of this period; documented history began with the arrival of the Aryans from North India. The Aryans introduced the use of iron and an advanced form of agriculture and irrigation. They also introduced the art of government. Of the Aryan settlements, Anuradhapura grew into a powerful kingdom under the rule of king Pandukabhaya. According to traditional history he is accepted as the founder of Anuradhapura. During the reign of King Devanampiya Tissa, a descendent of Pandukabhaya, Buddhism was introduced in 247 B.C. by Arahat Mahinda, the son of Emperor Asoka of India. This is the most important event in Sri Lankan history as it set the country on the road to cultural greatness. As a new civilisation flourished Sri Lanka became rich and prosperous. In the mid 2nd century B.C. a large part of north Sri Lanka came under the rule of an invader from South India. From the beginning of the Christian era and up to the end of the 4th century A.D. Sri Lanka was governed by an unbroken dynasty called Lambakarna, which paid great attention to the development of irrigation. A great king of this dynasty, Mahasen (3rd century A.D.) started the construction of large `tanks’ or irrigation reservoirs. Another great `tank’ builder was Dhatusena, who was put to death by his son Kasyapa who made Sigiriya a royal city with his fortress capital on the summit of the rock. As a result of invasions from South India the kingdom of Anuradhapura fell by the end of the 10th century A.D. Vijayabahu 1 repulsed the invaders and established his capital at Polonnaruwa in the 11th century A.D. Other great kings of Polonnaruwa were Parakrama Bahu the Great and Nissanka Malla both of whom adorned the city with numerous buildings of architectural beauty. Invasion was intermittent and the capital was moved constantly until the Portuguese arrived in 1505, when the chief city was established at Kotte, in the western lowlands. The Portuguese came to trade in spices but stayed to rule until 1656 in the coastal regions, as did the Dutch thereafter. Dutch rule lasted from 1656 to 1796, in which year they were displaced by the British. During this period the highland Kingdom, with its capital in Kandy, retained its independence despite repeated assaults by foreign powers who ruled the rest of the country. In 1815 the kingdom of Kandy was ceded to the British and thus they established their rule over the whole island. Modern communications, western medical services, education in English, as well as the plantation industry (first coffee then tea, rubber and coconut) developed during British rule. By a process of peaceful, constitutional evolution, Sri Lanka won back her independence in 1948 and is now a sovereign republic, with membership in the Commonwealth of Nations and the United Nations Organisation. 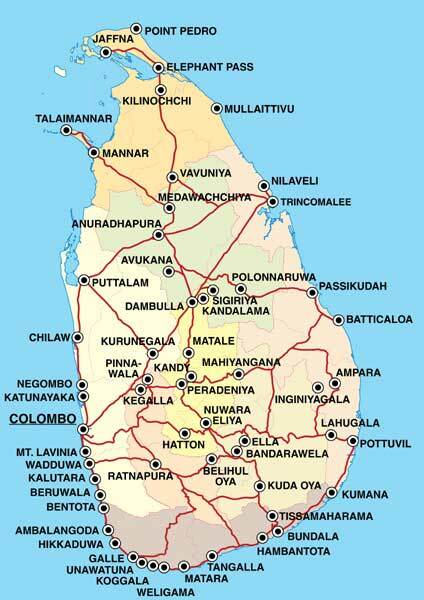 Sri Lanka has a population of 18.5 million of whom the majority are Sinhalese (74%). Other ethnic groups are made up of Sri Lankan Tamils (12.6%), Indian Tamils (5.5%), Moors, Malays, Burghers (of Portuguese & Dutch descent) and others (7.9%). Although Sri Lanka is a multi-religious country, Buddhists constitute the majority with 69.3%. Other religious groups are Hindus 15.5%, Muslims 7.6% and Christians 7.5%. Sri Lanka’s literacy rate of 88.6% is one of the highest in Asia.